One of my children’s favorite bedtime stories is the classic tale Stone Soup. Some travellers come to a village, carrying nothing more than an empty cooking pot. Upon their arrival, the villagers are unwilling to share any of their food stores with the hungry travellers. The travellers fill the pot with water, drop a large stone in it, and place it over a fire in the village square. One of the villagers becomes curious and asks what they are doing. The travellers answer that they are making “stone soup”, which tastes wonderful, although it still needs a little bit of garnish to improve the flavor, which they are missing. The villager does not mind parting with just a little bit of carrot to help them out, so it gets added to the soup. Another villager walks by, inquiring about the pot, and the travellers again mention their stone soup which has not reached its full potential yet. The villager hands them a little bit of seasoning to help them out. More and more villagers walk by, each adding another ingredient. Finally, a delicious and nourishing pot of soup is enjoyed by all. When I tell it to my children, I often make it up as I go along, having the villagers adding all sorts of unusual ingredients to the soup to the amusement of my two oldest children. I’ll have the villagers add things I know they love (like pasta and cauliflower) and things I know they dislike (like tomatoes), just to get them interested and to get a reaction. 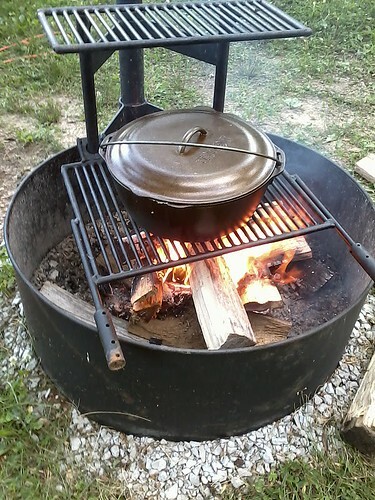 Recently, as we were planning a weekend camping trip, the children wanted to make “stone soup.” We decided to do this while on our camping trip, using a Dutch oven over the campfire to make a soup. We’d start the soup in the afternoon, let it slowly cook over the campfire, and enjoy it in the evening. You can do the same thing at home quite easily on your stove top. The only essential ingredient is several cups of water, which will provide the backbone for the soup. The entire spirit of stone soup is to pick a medley of ingredients. If you’re cooking this with a group, let everyone bring an ingredient or two. The entire fun of this soup is to find out what will come of the unusual mix. The only ingredients I would highly recommend are some salt and pepper for seasoning. Everything else is up to you. However, if I were making the soup, I would try to add some reasonably complementary ingredients to what other people were adding. If you’re getting into the telling of the story, you will also want to have a couple of large, well-cleaned stones. These aid in the cooking a bit as they help the soup to maintain a standard temperature, but they’re not necessary. In order to clean the stones, we actually cleaned them by hand, ran them through the dishwasher a few times, and boiled them for ten minutes. You don’t really need to do anything in advance other than thinking about things you might add. Some potential ingredients, like vegetables or meat, may need to be cut up or prepared in advance. It depends heavily on what you choose to include. 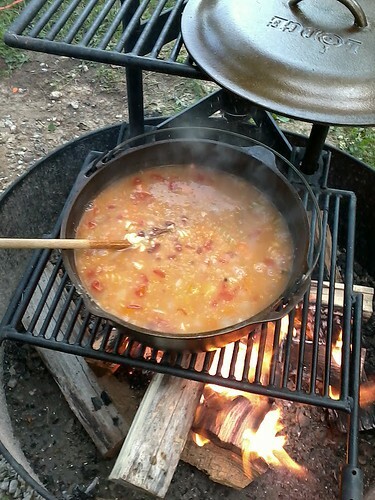 Although you can use whatever ingredients you like, I’ll describe the stone soup we made on this camping trip. We camped with several people and different people brought along different ingredients. We started off with two and a half quarts of water in the Dutch oven, along with three boullion cubes (much easier than transporting stock to the camp site) and our two stones. We placed this over the fire and waited for it to boil. As the soup began to boil, we added a diced potato, three chopped carrots, two diced tomatoes, one chopped onion, two handfuls of partially cooked mixed beans, and some chopped celery. We allowed this to simmer for about an hour, then added some salt and pepper to taste. We then added a handful of rice and kept cooking it until the potatoes and beans were tender. We then added some macaroni and some leftover quinoa, then cooked for another fifteen minutes or so. At this point, the vegetarians got bowls of soup, then we added a pound of cubed ham and allowed this to heat up for five or so minutes. The soup was then served with oyster crackers and shredded cheese. Remember, of course, that you can use pretty much anything in this soup. Pretty much any vegetable, any grain, any pasta, any herb, and any meat will work. It’s quite fun to cook this as a group, with people bringing unexpected ingredients. I would suggest that you give a bit of a guideline to others – for example, nothing too sweet and nothing anyone is allergic to – but let them bring whatever they like. It’ll turn out interesting at the very least.